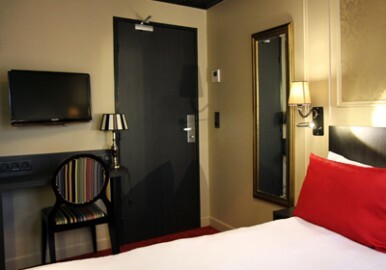 Designed in the Parisian Chic Bohemian spirit, the 3-star Hotel Best Western Hotel Le Montmartre Saint Pierre is nestled at the foot of “La Butte Montmartre”, a few minutes of the Sacre Coeur. Enjoy an Exclusive Offer by booking your stay with the promo code: EXCLU. For your convenience the hotel offers 48 quiet, air-conditioned and serviced by a lift rooms. With moldings and fireplaces in the Haussmann decorated rooms with beige, black and gold, contain high quality wooden furniture, a private bathroom with a rain shower, hairdryer, satellite TV and free Wi-Fi. Our originality: some of our bathrooms are open as a loft, smooth and airy. Buffet breakfast is prepared daily in the vaulted room with stone walls typical Parisian cellars. Enjoy newspapers and a vending machine drinks on site. 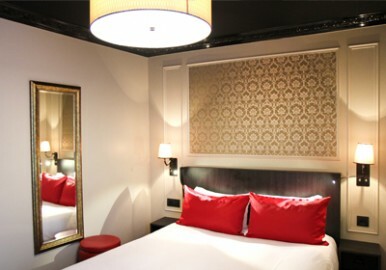 Conveniently situated close to railway stations in East and North, served by lines 2 and 4 of the metro, the Best Western Hotel Le Montmartre – Saint Pierre allows beautiful walks in the neighborhood of the artists of the Place du Tertre Moulin Rouge, and an easy access to all the museums and monuments of the capital. Air conditioning is available in your room. The hotel offers you unlimited Wi-Fi Internet access available throughout the hotel. 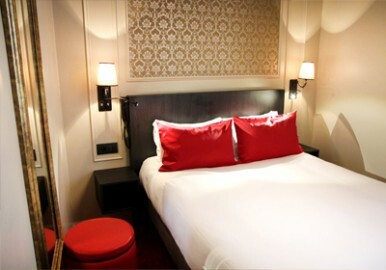 The hotel is just few step from the heart of Montmartre!